Epithelia are tissues with pronounced polarity along the apical-basal axis that form a boundary between different compartments of an organism. The gut epithelium, for instance, separates the gut lumen from the vascular system and is responsible for the transport of nutrients from the lumen into the blood. Epithelia have to be polarized to function properly. This means that the cells have to establish and maintain different plasma membrane compartments that differ in their protein- and lipid composition and are separated by intercellular junctions. The loss of epithelial tissue structure is a common hallmark of advanced tumors and is the prerequisite for metastasis. Consistent with these observations, many genes that are mutated in cancer have important functions in the control of cell polarity and epithelial tissue structure. 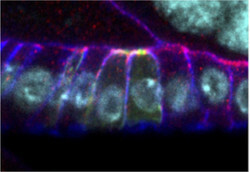 We investigate the molecular mechanisms that are responsible for the establishment and maintenance of epithelial cell polarity in Drosophila. We have identified genes that function as key regulators of cell polarity and have analyzed their function in this process. The components of the Par3/Par6/aPKC complex are of particular importance in this context, because they do not only control epithelial polarity but also the polarity of many other cell types, including stem cells and oocytes. In protein-protein interaction screens we have identified several interaction partners of Par3/Bazooka that are expressed in epithelia. One of these interaction partners is the protein Smallish that localizes to adherens junctions and induces apical constriction of epithelial cells upon overexpression. We currently investigate the molecular mechanism of this phenotype and aim to unravel the molecular network in which Smallish exerts its function. Image 1. 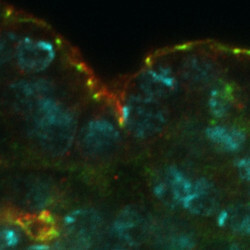 In the embryonic epidermis of Drosophila, Smallish (green) localizes to adherens junctions, whereas the transmembrane protein Crumbs (red) localizes apically to Smallish in the sub-apical region of the plasma membrane. DNA is marked in cyan. Image 2. Overexpression of GFP-Smallish (green) in clones in the follicular epithelium of the Drosophila ovary causes apical constriction of epithelial cells. Bazooka/Par3 (red) localizes to the adherens junctions and Discs Large (blue) marks the basolateral membrane domain. DNA is marked in cyan.